Marie (Mary) C. Tremble was the daughter of Therese Archange Morin Tremble Mann and Toussaint Tremble. She married John Anderson Sr. In the 1833 Treaty of Chicago, Marie received $500. John and Marie had three children: John Jr., Peter and Marie Anna Anderson. John Jr. married Elizabeth Hardin, and his brother Peter Anderson married Elizabeth’s sister Julia. Both women were Potawatomi and granddaughters of Claude Laframboise. John Jr. and Pete’s families helped get the Tribe established in Oklahoma and were some of the first Potawatomi to settle on the new lands. John and Marie’s daughter, Marie Anna Anderson, first married Louis Harris. After her relationship with Harris ended, she married Antione Bourbonnais of Potawatomi and French descent in 1856. Jean Baptiste Beaubien, circa 1780 of Detroit, Michigan, was one of the earliest residents of Chicago. He became a well-known fur trader after learning the business from his prominent fur-trading family and an apprenticeship with William Baily across the Great Lakes region. Most records indicate Jean Baptiste married five times. In his first marriage, to an Ottawa girl, he had one child, Marie. He then remarried a second time to a Potawatomi woman and sister of Chief Shabbona, Mah Nah Bun No Quah. They had two sons, Charles Henry and Madore Benjamin. Both sons married Potawatomi women. Jean Baptiste’s third wife, Josette Laframboise was half Potawatomi and the daughter of Frances Laframboise. Records show Jean and Josette had 12 Potawatomi children together. Jean bore four children with his fourth wife, Catherine Pinney, and eventually married a fifth and final time to Elizabeth Anthony. Theresa, Kee-ko-quah Chee-Chee Laframboise— daughter of Chief Joseph Laframboise and Theresa Peltier Laframboise — married Allen Hardin at age 14. Unfortunately, the marriage did not last. Teresa’s second marriage to husband Thomas Watkins also ended in divorce. In 1854, Theresa met and married Madore Beaubien. They lived prosperously with their growing family of 13 children until the forced removal of Indians from Illinois by the federal government. They were removed west of the Mississippi River, and the government paid $1 an acre for Joseph Laframboise’s valuable land. Joseph Bertrand Sr. was born Oct. 8, 1778, on Mackinac Island, Michigan. The American Fur Company employed him, and he made his way to the St. Joseph River valley in 1803. There he married Madeline Bourassa — daughter of Daniel Bourassa and an unnamed Potawatomi woman circa 1781 — near the portage landing of the St. Joseph River. Joseph and Madeline became an influential fur-trade family in the area. Joseph also served in leadership roles by representing the Potawatomi in negotiations of land cession. Joseph and Madeline had seven children: Joseph Jr., Samuel L., Benjamin Hendre, Laurent Joseph, Theresa, Alexander Amble and Julia Justine. The descendants of Madeline Bourassa and Joseph Bertrand Sr. flourished. To Madeline Bertrand, wife of Joseph Bertrand, a Potawatomi woman, one section of land at the Parc aux Vaches, on the north side of the river St. Joseph. To Joseph Bertrand, junior, Benjamin Bertrand, Laurent Bertrand, Theresa Bertrand, and Amable Bertrand, children of the said Madeline Bertrand, each one half of a section of land at the portage of the Kankakee River. On Oct. 10, 1814, Francois Bourbonnais Sr. and Catherine (Catish) Chevalier exchanged vows at St. Joachim’s in Châteauguay, Quebec. Francois Bourbonnais was a known trader in the early 1800s. They settled in Illinois and gave the Bourbonnais name to a village known as Bourbonnais Grove circa 1830. They had six children: Catherine, Peter, Ozette, Antoine Sr., Washington and Francis Jr. According to the 1832 Treaty of Camp Tippecanoe, Catherine, Francois, their son Washington and granddaughter Mawteno (Francois Jr.’s daughter) each received contiguous sections of land adjacent to the north bend of the Kankakee River near Soldiers Village, Illinois. In 1836, the federal government removed Francois, Catherine and family to the Platte country west of the Mississippi, along with most of the Potawatomi of the Prairie and the Kankakee. Madeline La Sallier — daughter of a Potawatomi woman and Pierre La Sallier — was the second wife of Joseph Ogee. Joseph was the son of Michel Auge and an unnamed Indian woman. Joseph Ogee and Madeline La Sallier lived in Peoria, Illinois where he represented the American Fur Company early as 1818. He later had charge over the trading station. Madeline received a grant of land near Paw Paw, Illinois, in 1823. That same year, Joseph paid $10 for a license to run an inn and tavern at his house. Joseph and Madeline also organized the First Methodist Church in Peoria, Illinois in 1824 and helped to build the town’s first school in 1826. 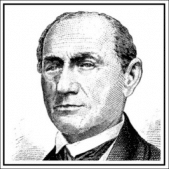 With the help of their friend John Dixon, Joseph Ogee opened a successful ferry crossing Rock River near present-day Dixon, Illinois. The union of Joseph and Madeline produced four children: Jacob Price Ogee, Mary Margaret Ogee Weld, John Lafayette Ogee and Louis Henry Ogee. Madeline bore two more children, Albion Alcott and Elizabeth J. Alcott-Beaubien, during her second marriage to Job Alcott. George Pettifer was born in November 1836. In his mid-20s, he married Elizabeth Munin, born in October 1839. They wed on the Potawatomi Indian Reservation in Kansas, where they began a family of five children: Susan Pettifer Williams, Mary Lydia Pettifer, Lola Rosetta Pettifer, Isabelle Pettifer Schalles and George S. Pettifer Jr. The Potawatomi of Kansas, known now as Citizen Potawatomi, left to settle land in Indian Territory. 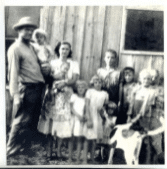 In spring of 1871, George, Elizabeth and their children were one of seven families first to arrive at their allotments located in the new reservation known as Pleasant Prairie in present-day southern Pottawatomie County. Shortly after, an educational institution known as The George Pettifer Day School was established approximately 3 miles northwest of Asher, Oklahoma. Mary Margaret (Mack) McWinnery, a full-blood Potawatomi, was born in 1844 in Michigan. She was orphaned at a young age, and a non-Indian couple named McWinnery adopted her. Mary traveled to Kansas to study at St. Mary’s, where she eventually met Amable Toupin, a French-Canadian who looked to make a fortune on the early American frontier. Amable joined a wagon train heading for California but fell ill in the small prairie town of St. Mary’s, Kansas. A sister at the local convent nursed him back to health, and it was here that he connected with Mary Margaret. They married four years after meeting and had eight children together: Mary Margaret Toupin Trousdale, Paul Toupin, Adele Toupin Bowles, Alexander Toupin, Simon Toupin, Theresa Toupin Tierney, Magdeline Toupin Chilson and Amanda Toupin Martell Neddeau. The Potawatomi family name Wano originated in the 19th century and stemmed from the elusive Chief Edward Shipshewana. The name Shipshewana, sometimes pronounced Ship-she-wah-no, means Vision of a Lion or Wild Panther at Large. He was the son of the Potawatomi Chief Pam-mon-ke-duck, which translates to Wandering Boy. Edward Shipshewana began a legacy for the Wano family that spread through Indiana, Kansas and eventually Oklahoma. Edward and Zoa Shipshewano gave birth to Peter Shipshewano, Pa mahm ke-tuck, in 1860. Peter married Julia Bruno, Ke-pe-wa-qua, whose parents were John B. Bruno, Pa-tese, and Mary Rhodd Bruno, Mah-nee. 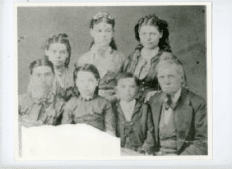 Peter and Julia had five children: Zoe, Frank L. Sr., Isaac, Stella M. and Benjamin. Madeline Vieux, the daughter of Jacques Vieux and Angelique LeRoy, married Jean Baptiste Yott in 1821. This union bore six children: James B., William, Mitchell, Joseph, Andrew and Madeline. Jean Baptiste and Madeline were removed with the Potawatomi to Kansas and, ultimately, Oklahoma Territory. Madeline and Jean’s son James B. Yott and 10 out of his 11 children received allotments in Oklahoma through the 1887 Dawes Act. James B. Yott’s sister, Madeline Yott, married Narcisse Mathias Juneau. Narcisse’s father, Solomon, founded Milwaukee, Wisconsin, in 1818. Madeline received an allotment in Oklahoma but Narcisse did not.